With all of the GDS2 running around on the internet today, sometimes it’s nice to go around and see what needs fixing. In this new column (hopefully), I take a look at someone’s completed/semi completed set and try and fix what I believe to be a major problem with it. At the moment, I’m going to stay away from the GDS2 Top 8’s entries until they are eliminated if I want to cover that. I won’t be looking at individual cards, but a mechanic as a whole. I’ve been talking about theory on here for a while (though not enough theory in my opinion, but that’s my fault), and I want to have some real evidence here to show you what as a designer can do better. This is not to poke fun at the designer, but to show case different things they may not have thought of before since many of the amateur designers on the internet create a whole set by themselves. It’s to help you learn how you can see what Wizards does and how you can avoid common pitfalls. Today’s mechanic, I take from Evan “The Magic Show” Erwin’s set: Rise of the Titans. Created in 2007, it’s not the most recent creation in the block, but I think the mechanic that needs fixing is a great place to start. Overview: Right off the bat, you can tell it’s a mixture between two mechanics: Flashback and Traps. While the Trap mechanic wasn’t released until 2009, it’s an interesting idea of two things that it would seem go well together. What’s good: Everybody loves being able to cast spells twice (or more) and something that can have an effect from a graveyard means it can see play in older formats. While it does allow the card to get cast for free, it’s not broken because it exiles it preventing it from huge abuse. Plus, it only happens during certain points in the game, it’s not a mechanic to be using it to replay Wrath of God over and over again. What’s Bad: There’s a mechanic from Coldsnap called Recover. Have you ever played with a Recover card or against someone who has? Ever forget the graveyard trigger? Recover is a mechanic that tries to help you remember that it’s in the graveyard by having the effect only trigger when a creature is going to the graveyard. Not everyone catches it all of the time, nor even remembers it’s there. It’s easy in a casual game to go, “Oh, yeah, oops. Let me just do it now.” But in a Pro Tour and PTQ level? Now suddenly you have to pay attention for everything that you do and read every card in the graveyard carefully. It’s not just you, the player, as the one who should know everything in your deck, but all of your opponents as well. While this might be one of the most obscure triggers in the set (Really? A Green creature you control becomes blocked? ), it’s a common which means it will pop up all of the time. Your opponent shouldn’t have to constantly check the graveyard to see if they should do something. Especially blocking a random Green creature. “But what about the Trap mechanic you mentioned above? They all have different triggers and do different things.” True, but that information is all kept in your hand; it’s called a Trap for a reason (Not because WotC are huge fans of Admiral Ackbar). You opponent isn’t supposed to know what traps they have in their hands and what triggers cause them. Because you’re holding the cards in your hands, you can easily remember to cast them (so the theory goes), especially with the element of surprise. It’s all about board complexity and how much you want to crowd the board (Graveyard and Exile zones too). When you have too much info to process, no one is having fun but trying to crunch numbers. Yes, some people think that’s fun, but it can be way too complex for most players. Remember, everyone might not always play the same cards as you but they play the same game. Don’t think, “Well, that’s just for this type of player so I can ignore the rest,” because that would be a very bad thing as you’re pushing the game to a place where it doesn’t belong. I’m not saying that trigger based mechanics are bad; it all depends on what you do with them. Having multiple triggers for the same mechanic can be a bad thing, since those can get missed all of the time. 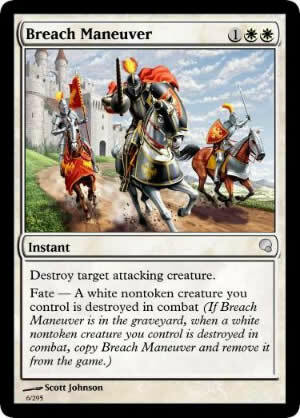 By having your mechanic trigger when something deals damage, or goes through unblocked or whenever a creature comes into play are all easier and less specific triggers than “A nonwhite token creature gets destroyed in combat.” If Magic was mostly on computers, then I could see more cards like that since the game engine would know what’s happening and won’t forget to active those triggers. But, it’s not so they don’t print stuff like that. The key between that and something like Traps are known information. If you have a creature with Morph and a triggered flip ability is the same as the Trap cards in your hand. The card is flipped over on the battlefield, not shoved in a pile in the graveyard buried under ten other cards. While I like graveyard mechanics, it can get real tricky and complicated real fast. Diagnoses: Unless Evan wants to change Fate to be Flashback, I say this mechanic needs a ton of more work. If you look over his file, all the of the Fate triggers happen on strange parts of the game. “Discard a card, whenever a Green creature enters the battlefield, whenever you return a creature to your hand.” All of these situations create more thinking and more memory to commit than what you’ll get from playing them. Streamlining the trigger would take away the fun and the uniqueness of this mechanic. Though there is one possibility: have each color have it’s own trigger. While you’re losing some of the wackiness of the original intent, it would make it easier to remember since each color has only one thing to remember. Those triggers would be based around what the theme of the block would be, and left up to the designer. I hope you liked this column, as it’s not meant to bash any of the designers, but help them out with another pair of eyes. You’ve got ways to fix this mechanic? Let’s hear it. Throw your comments below. Just thought I’d say I enjoyed the post. I’m really getting into design, now (ironically) that I’ve be eliminated from the GDS2. I think its awesome that you’re doing set reviews and talking about common design mishaps. Have you considered reviewing non-contestant submissions? I know all of us who are doing the mock submissions love feedback, considering we really don’t get that much next to the Top8. Think about it. Fate — When you cast this spell, if a green creature you control is being blocked, copy this spell. You may choose a new target for that copy. The cards lose some versatility (and get weaker, unless you adjust them accordingly), but avoid any memory issues. Some cards, like Breach Maneuver, would have to be changed more substantially to work with this version of the ability. Hold the phone! It would get copied a whole mess of a lot of times if you phrase it like that. They copy would have Fate still, and be replicated for each blocked green creature. Unless, that was your aim, of course. Actually the trigger wording says “When you cast this spell”. It only triggers once, and the copy will not trigger because it is being copied, not cast. Well, one possibility is to adopt the Trap template, and make them optional uses (instead of Recover, which was mandatory). It makes the mechanic slightly more powerful, but it clears up a lot of rules. It still has the memory issues that were tied to Flashback, which is another set of problems, but it does alleviate the awfulness of Recover. Fate — Exile Elven Sideslice from your graveyard: Put a copy of Elven Sideslice onto the stack. Play this ability only if a green creature you control became blocked this turn. Good article. Sums up my problems when I first saw the mechanic too. Far, far too complicated. Looking at Evan’s mechanic reminds me of the Chroma mechanic, specifically Umbra Stalker. Chroma here depends on the number of black mana symbols in your graveyard. I think that’s sloppy. Flavorwise, I see this mechanic as being black. I don’t think changing the Fate text to trigger exclusively on creatures going to the graveyard as a bad idea. Black wants power at any cost, so intentionally sending creatures to the graveyard to cast Fate works flavorwise. It also acts as a reminder to check the graveyard as creatures go there. A lot of people, myself included, would agree that Chroma was too complex. I also think R&D would agree, since they considered the LORWYN/SHADOWMOOR year an example of how they can create overly complex board states without doing anything zany rules-wise. I’m sure Chroma was considered part of that problem.